Sept. 26, 2018 — Art has a representation problem. Katie In ’13, a musician, video maker and educator, has seen it on a global level such as the #OscarsSoWhite movement to the types of gallery spaces provided to artists locally. 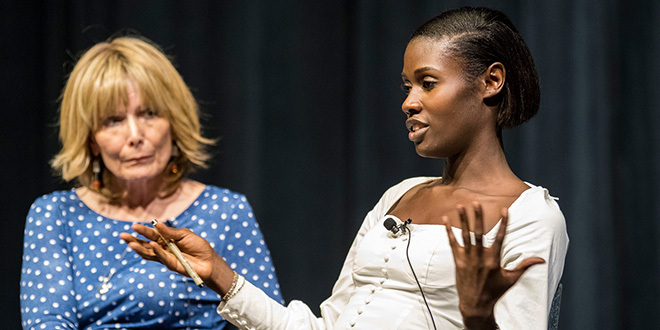 In made these comments during a panel discussion called Change Makers and Path Breakers, the opening event of the Artists as Activists: Creatively Driving Change Symposium that took place Sept. 20-21 at Grinnell College. The symposium was co-sponsored by the Center for Careers, Life, and Service and the Office of Development and Alumni Relations. The symposium highlighted alumni artists who use their talents to create meaningful change in their communities and the world. 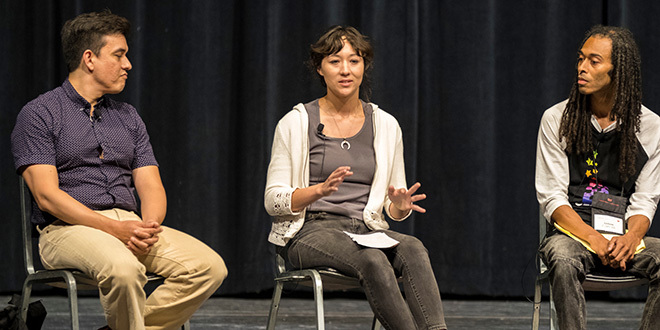 Eight alums traveled back to Grinnell to present workshops and presentations that inspired students and alumni to make a difference. Juan Castaño ’00, managing director and co-founder of Calpulli Mexican Dance Company in New York, considerers every performance a resistance. Calpulli performances celebrate Mexican tradition, history, and stories. This was the first symposium held by the College’s Arts, Media, and Communications Career Community. The community was set up in the spring to help students design meaningful careers in fields as divergent as the performing, written, and visual arts; film; journalism; marketing; and advertising. Through the Center for Careers, Life, and Service’s career communities, students have access to specialized advising, tailored programming, and experiential learning opportunities. Interactions with peers, alumni, and recruiters are designed to help students further explore, clarify, and pursue meaningful post-graduate pathways. Valerie Levett ’73 listens to Na Chainkua Reindorf ’14 during a panel discussion. During the symposium, alumni offered advice to students as they prepare to embark on their own careers. As a self-described introvert, when Na Chainkua Reindorf ’14 heard about a new endeavor, her initial reaction was to turn down the opportunity. She eventually forced herself to step back and re-evaluate. The event’s keynote speaker was Dave Loewenstein ’88 who shared his experience as a muralist, printmaker, and arts organizer. Loewenstein’s prints, which focus on social justice issues, are exhibited internationally and are in the collections of the Museum of Modern Art in New York, Yale University, and the Center for the Study of Political Graphics. Symposium participants also took part in film showings, musical performances, and hands-on workshops. Jones led a workshop called Craft vs. Consciousness, which explored how to come up with strategies that balance traditional theatre training with the way theatre for social change can be developed. In guided a participatory workshop for those interested in songwriting. The symposium also included “Soar,” a community art project. The idea behind the project was for participants to identify what burdens weigh them down and then let go of those burdens so they can become freer. Participants wrote the burden on a rock, carried it around for a while to symbolize carrying the burden, and then let go of the rock. Lastly, they hung an origami bird to symbolize the freedom and potential to soar. Brooke Vonderheide, Grinnell College assistant director of donor and alumni relations for career programs, said it was moving to read some of the personal burdens and experiences people described on the rocks. Learn more about all Grinnell’s six Career Communities. For additional details about the Arts, Media, and Communications Career Community, contact director Rachel Edwards Harvith ’00 at harvith2@grinnell.edu or 641-269-4081.